Just because I live for indie comics doesn’t mean that I don’t want to see some action-oriented comics every so often. While I love comic books with pizza as a metaphor, I also dig heavy metal. So, every so often, I get excited about titles about “a deadly killer” that is “hunting the man responsible for her parents’ deaths and meets him – on the day he becomes President!” It was some description very similar to this one, from the back of Epic Kill that I read in Diamond Previews which convinced me that this new book from Image comics was a good investment. So, while many great indie books are about some very mundane topics, it’s not required of them. The Big 2 have established a huge audience of action junkies which we as indies should certainly tap into as often as possible – in some ways, they are the simplest to convert. And after they read shoot’em up comics like Epic Kill, we can hopefully get them to read wonderful stores like By the Slice. 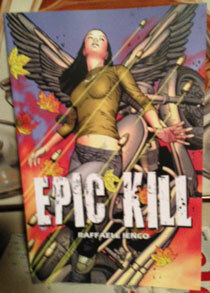 This entry was posted in Columns and tagged action comic books, by the slice, epic kill, heavy metal, IMAGE COMICS, indie comics, raffaele ienco. Bookmark the permalink. Follow any comments here with the RSS feed for this post. Post a comment or leave a trackback: Trackback URL.